Its always exciting when booking your ADRs to be adding established destinations you have never visited for various reasons or in the case of Sanaa, a totally new establishment. Sanaa actually opened May 1st 09 in Kidani Village, a DVC property that's part of the Animal Kingdom Lodge compound but for some reason we missed it last time probably as the Wave seemed to be being pushed more as the new restaurant of the year. Using the Disney Transportation System it should be a reasonably easy place to get to. Technically a bus to any park will do then change for AK Lodge. Its quicker to go straight to AK itself though as the Lodge is only a few minutes away and the bus will stop at Kidani Village first anyway. I say should because I'm not sure whats going on this year but so far the buses seem to have been rather poor compared to previous trips; sporadic, infrequent and in typical British style you wait for what seems an age in freezing conditions only for three to turn up at once. 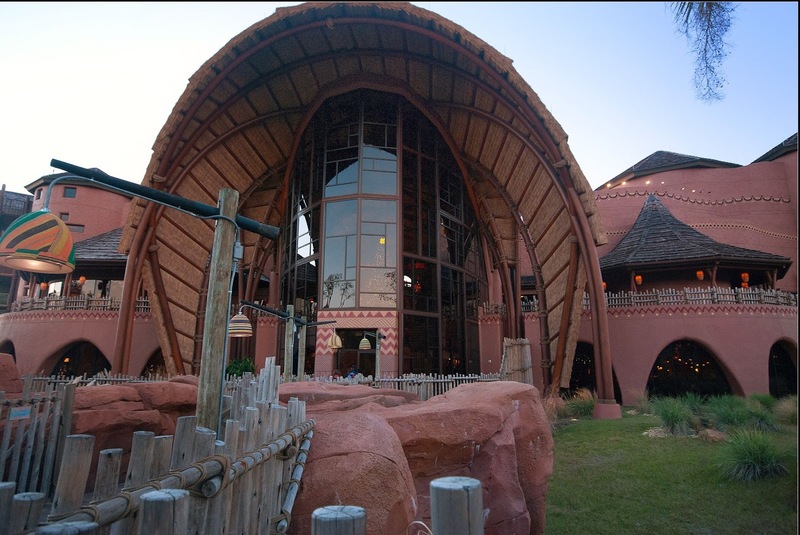 However once we arrive at Kidani Village the restaurant is easy to find and we are checked in and given the usual vibrating buzzer. You can walk out from the restaurant's lobby to a large outdoor grazing area where thougthfully a large fire is roaring and African CMs are on hand to point out the various animals on the plains. It's not too long before something's buzzing in my pocket and our hostess is taking us to our table. I like Sanaa straight away, the lighting is atmospheric and well designed and the whole place is just beautiful. 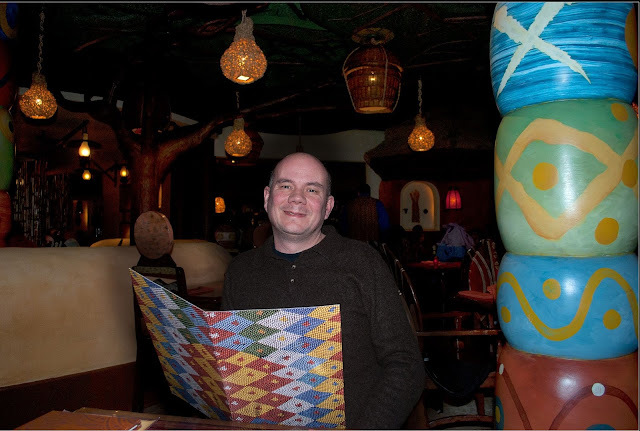 Chris our server goes carefully and in great detail through all the menu choices which is a fusion of Indian and African cuisine with more emphasis towards the Indian side. To be fair coming from a country where Indian cuisine is almost the national dish it's all quite amusing, but Chris delivers his knowledge with real enthusiasm. A selection of breads and pickles are selected to accompany the meal and poppadoms to start; though oddly the breads are listed as a starter which seems a little strange to me. At home Indian cuisine in our town is in general dominated by a couple of established restaurants and countless others who specialize in takeaway only. My simple rule with an Indian restaurant is consistency and it's here I find they always let themselves down. Good one week, the same dish can be poor the following week as if the chefs making it up as he goes along. One other key element is the quality of the Nan breads out of the tandoor. Beautiful thin and light one week, a lump of dough the next. At Sanaa the breads arrive and we are transported to Nan bread heaven. Light and thin with just the right balance between the crisp outside and fluffy interior. The Paratha is also a joy though I would have preferred the Paneer cheese to be more "lumpy" rather than blended into the fried paratha bread as the whole point of Paneer is the cheese can stand the cooking process without melting. Poppadoms which are probably the same the world over are fine but here its the pickles that are the revelation. I will never now be able to have mango chutney from a Pataks or Sharwoods jar again without thinking of the utter delight that was served to us in Sanaa. Beautiful soft fresh mangoes diced with a subtle spice mixture and a good amount of freshly chopped chili for heat has now spoilt us for life. 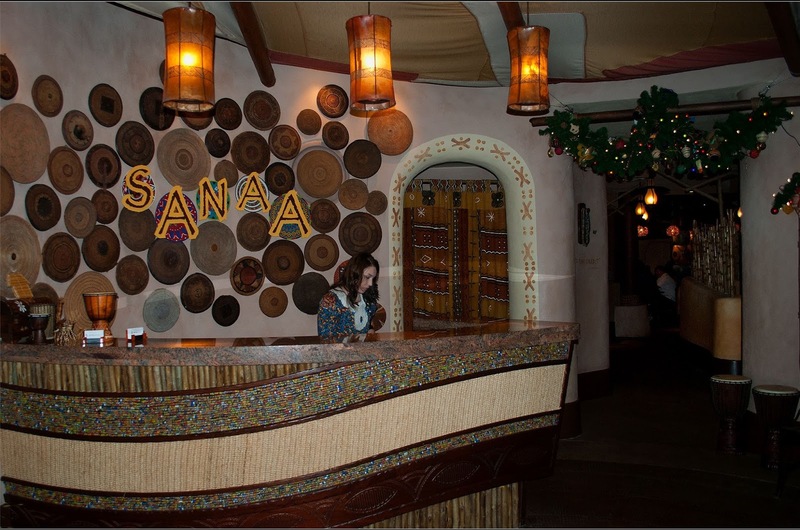 Sanaa has quite a good menu system in which you choose either Tandoor dishes or assemble a selection of curries. On top of that there are fish dishes in spiced broths. I decided to try the curries and selected two from the choices that had very different styles. On the left we have a more Thai than Indian or African influenced Shrimp dish in a green curry sauce; well spiced with a good amount of heat, very fresh in the mouth with coconut, coriander and chili being the prominent flavours. The Beef dish on the right was more unusual and probably not something I would choose again. The beef was cooked beautifully, real slow pot stuff that melted away in the mouth but the sauce was a little on the sweet side for me. Fluffy Basmati rice, Tusker Beer and Mango Lassi completed the whole dish. 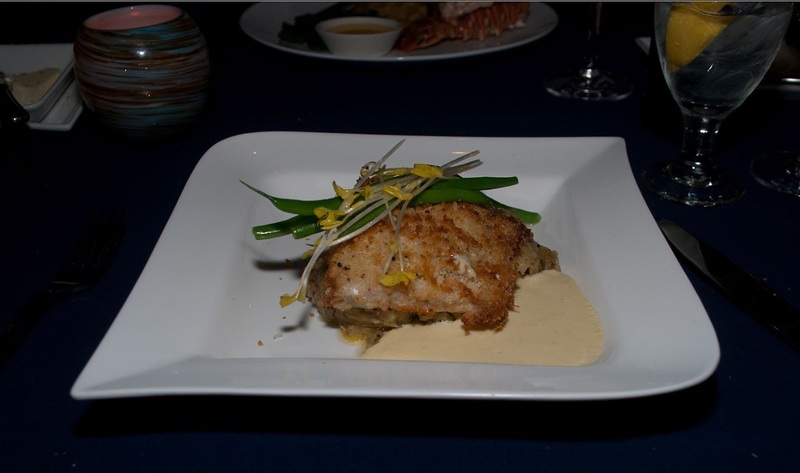 Jackie chose what is described on the menu rather simply as "Todays Sustainable Fish". To be honest Chris described this so well I almost had it myself. It consisted of piece of Arctic Char imported from Iceland, a salmon like fish that tastes very like sea trout and will probably be the big new sustainable hit of the next few years. 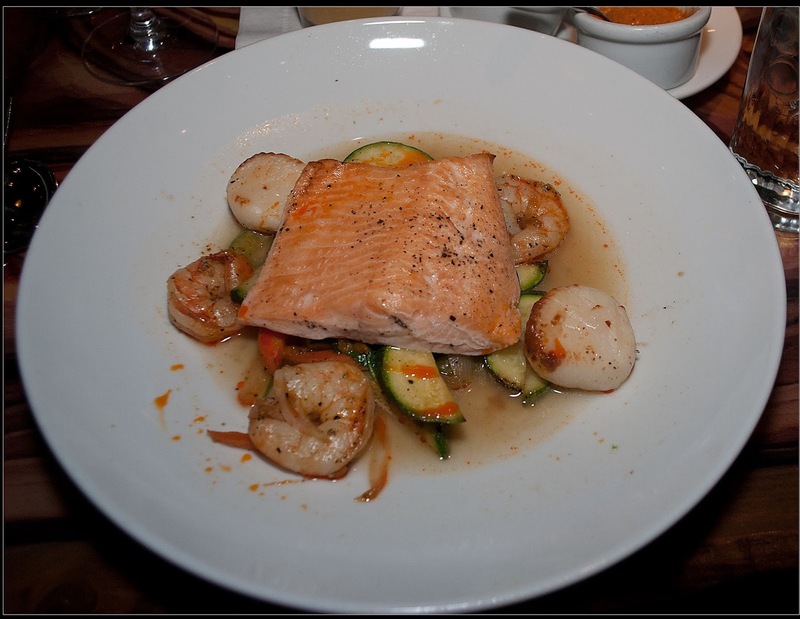 This is served with scallops and shrimps in a lightly spiced curry broth with vegetables. The broth is described as a blend of white wine, fish stock, citrus with light thai curry spices. Its absolutely divine, has just the right amount of kick so as to give slight heat but not overpower either the fish or the scallops and shrimp and was the star dish of the night. Casa Grand Pinot Grigio washed it down for Jackie with a Mango Lassi on hand for cooling purposes. All in all this was one of our favourite meals of the week. Great atmosphere, superb food and such a wonderful setting. Can't wait to return. Narcoosees is one of the Restaurants that has been a regular stop on our list for many years. We love the setting, the menu and the ambiance. Timed correctly a meal can have an interlude on the jetty for the water pageant and for the first MK firework display. On top of that we simply love seafood , though it has to be said Narcoosess offers quite a lot more than that. The original plan had simply been to cross over from Epcot where we had spent an EMH day to the MK on the Monorail and from there take the launch across the lake which conveniently disposes of you on Narcoosees doorstep. However with this being our first full day combined with a 5.45am Stitch wake up call for the EMH we came back to the resort mid afternoon to recharge our batteries. Getting back to the Narcoosees on Disney Transport proves to be a bit of a chore, especially with a wind chill that's almost freezing. We have to wait what feels like longer but must be the full 20mins for a MK bus to turn up only to find when we arrive at the MK that the launches are not running to the Grand Floridian (probably because the lakes frozen up :) ). This means taking the monorail the wrong way around the lake and getting dropped off at the wrong side of the Grand Floridian. Eventually we arrive 25 mins late but are soon seated. I'm not sure if Narcoosees has a heating problem tonight or its interior design simply makes it difficult to keep warm when its cold outside (which seems to be when we come at Christmas). A CM has actually been placed on the door to ensure it remains shut but shes fighting a losing battle against the icy wind. Our server sorts out the drinks and wine and food is ordered, Jackie orders the Crab crusted Mahi Mahi, served on a bed of crushed potatoes with french green beans and a meyer lemon sauce. The fish is well cooked, just on the point and the crust is well finished with a proper crisp texture rather than something to wet that's trying to slide off and its well seasoned with a good crab flavour coming through. The potatoes are a good accompaniment keeping the dish well balanced and grease free. However its the sauce here that's the real star, those meyer lemons really making a difference. A meyer Lemon is a completely different beast to the acidic beauty you use to put in your G&T; its soft full of lemony buttery depth (is that a word) but with none of the harshness or bitterness. This simple sauce brings the whole dish together. 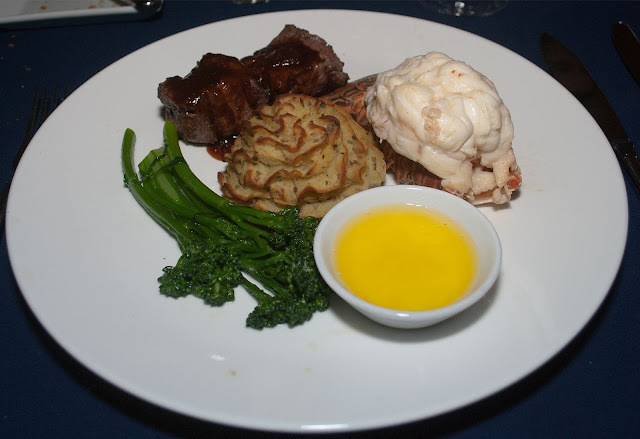 On the last trip I seemed to recall looking longingly at the table next to ours as they tucked happily into a surf and turf and I'm torn between it and the full Maine Lobster which I was watching the chef prepare with robotic precision as we waited for our table. In the end I go for the classic surf and turf a) Because I have never had it here before (in fact I don't think I have ever had a meat dish here before) and b) because I need a bottle of red wine to warm my bones up rather than the chilled sauvignon Jackie is drinking and it will go nicely with the fillet steak. Whilst those two medallions of filet mignon may look on the small size they are very very rich, nicely tender and cooked exactly how I asked (rare). To be honest I find that fillet is more about texture than taste and would much prefer a piece of good sirloin if I was after taste but the rich onion demi glaze served with the fillet is an excellent accompaniment to that buttery texture adding that depth of taste I always find this cut of meat lacks. The lobster has a firm texture in the mouth you always get with large maine beasts. However the depth of flavour is off the scale with a lovely sweetness in the mouth. I personally would have preferred a little thermidor sauce to complement it rather than the clarified butter Americans seem so fond off - but when in Rome. The Duchess potato is further enhanced with a little onion and some small ham pieces and is very well seasoned. I could eat this all week given a choice of potato sides. On to desserts. Jackie has the sweet tooth; my sweet tooth extends about as far as a bar of good chocolate but does not really get excited at a dessert menu. Last trip I was very disappointed to find Narcoosess had actually removed the Cheese Selection from the dessert menu but its back this year as the Artisinal Cheese Selection which is basically the same selection the California Grill has always served. A lovely choice of locally produced American Cheeses and thankfully not a lump of Monterey Jack Among them. Jackie tucks into the Ozark Apple and Walnut cake with poached cranberries and ice cream. Must have been good as there's no time to get the camera out before its gone! All in all then yet another successful trip to Narcoosees.